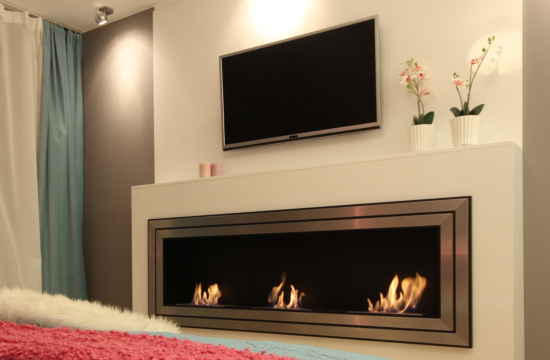 A modern home needs a modern fireplace, and a bioethanol fireplace could be the perfect option. 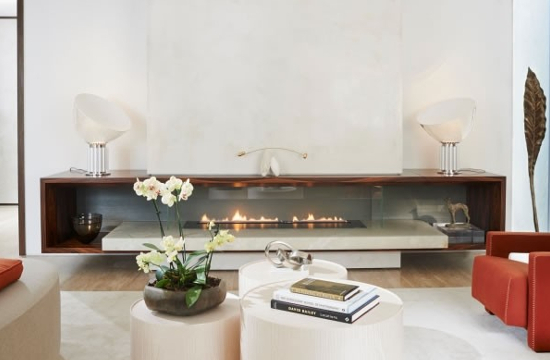 The bioethanol fires that we produce and sell are ideal if you want to add a fire to your home with no wires, no gas, no electricity and no worries. In recent years, bio fires have become incredibly popular on the market with clients favouring this choice over alternatives such as wood burning and multi fuel stoves. Our range of Wall Mounted Flueless Fires have been specially designed for use with Liquid Bio Ethanol Fuel. The range includes a variety of styles which are both contemporary and functional. These Eco-Friendly Bio-Fuel Fires are not only pleasing to the eye but are easy to operate and simple to install. The beauty of our Bio-Ethanol Fireplaces is that some of them can be used as either an indoor fire in the winter or an outdoor fire in the summer giving a cosy atmosphere in both situations. We offer a choice of freestanding fires (see below) which should cater for most tastes. Please note these fires are not suitable to be left outside and exposed to all weather conditions and it is strongly advised that they must be protected. Those fires which are portable should be stored indoors when not in use. Our range of Bio-Ethanol burner insert trays and fire boxes are a perfect solution for the bespoke bio-ethanol fireplace. Please note if deciding to use these trays in your own flueless ethanol fire design the final fireplace must be built of a non combustible material in line with national building regulations. 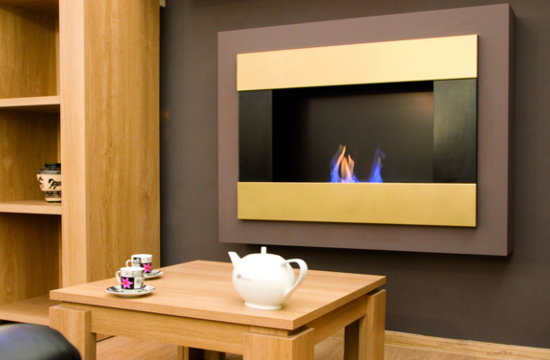 Fuel for our bioethanol fireplaces is available to buy from our site. We offer a range of bio-ethanol fire bowls and bio-ethanol fire basket designs for use in existing fireplace openings or as free standing ethanol burners. The CVO bowls are stunning and bring the ‘wow’ factor to any room and are available in stone or hand polished bronze or aluminium. A selection of the bio ethanol fireplaces in sizes of 1000mm (1M) or wider for homes which require a long contemporary fire design. The model shown above features 3 burner trays which can be lit together or independently depending on user choice. 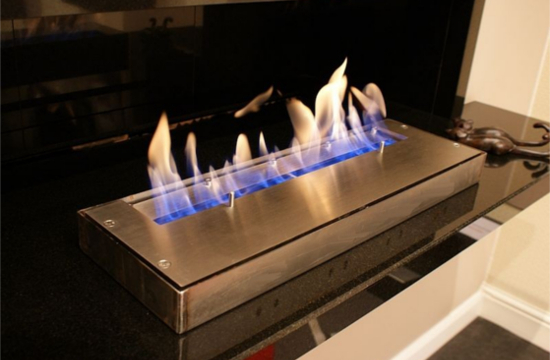 Our high quality bio ethanol FIRE RIBBON ® BURNER trays are available in 2 sizes – 600mm and 1000mm. These are manufactured from very high grade stainless steel and are supplied with a safety tray. The trays include special matting to stabilize the flame and to increase the burn time. 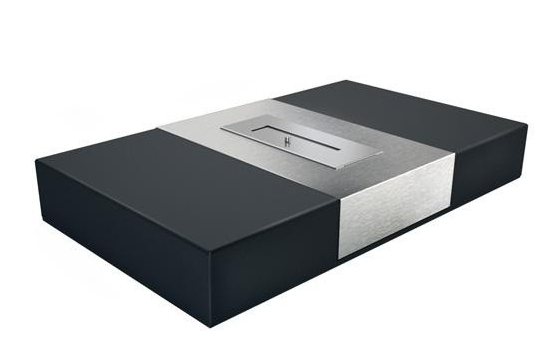 Remote Control Bio-Ethanol Burner Trays, these high quality ribbon burner inserts are operated by remote control and have a 240v power supply. These high quality, CE approved remote burners are built to the latest safety standards and are available in 5 sizes from 660mm wide to 1800mm wide. The remote bioethanol burners have heat outputs ranging from 3.8Kw (660) to 12.3Kw (1800). You’ll find that there are many advantages of investing in a bio ethanol fireplace. Reduced Maintenance – Cleaning out a fire or stove can be a chore, and if you have a biofuel fireplace, you can avoid this issue completely. 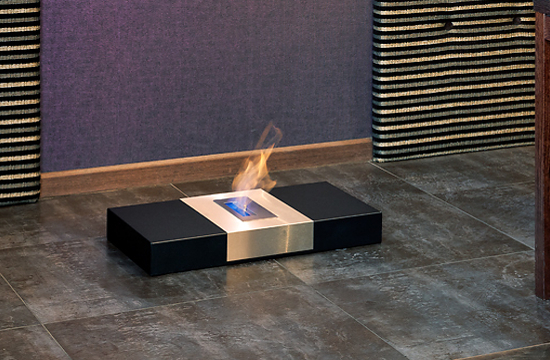 Bioethanol fires require little cleaning, making them the perfect choice for low maintenance living. Simple To Install And Use – You might think that installing a new ethanol fireplace in your home will take days or even weeks. Nothing could be further from the truth. Thanks to simple, sleek designs these bio fuel fires can be set up and installed within a short time frame. Some even work as soon as you bring them home. No Fumes Or Smoke – One of the issues will older fires is that they will produce everything from smoke to smells and fumes. With a bioethanol fire, these issues are problems of the past. Instead, there’s no need for a chimney, vents or a flue system because they only create a limited amount of CO2 and water vapour. It’s not just fumes that are eliminated either. These fires don’t make a sound or produce a smell, providing the perfect clean, contemporary living option. They’ll also burn for up to eight hours without more fuel needing to be added dependant on the model chosen. It’s not just about the simple installation. These devices are easy to use too. Bioethanol fuel is added and then the flame can be lit. 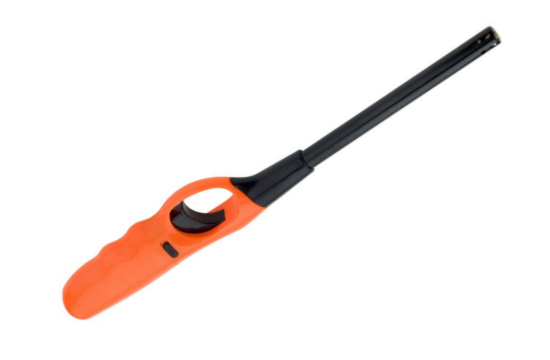 After a few minutes, the fire will be ready for use, and you will be in complete control of the flame level. As such, you can decide exactly how hot you want the room or how much energy you want to use. Some devices are even suitable for smart control. 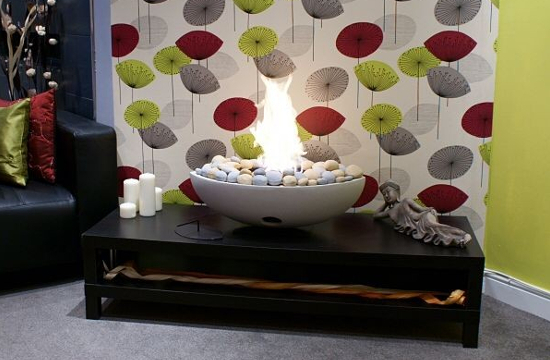 You can get a bioethanol fireplace in a range of different designs. Choose how you want to display your fire from a freestanding model to one built into the wall or even a model for an outdoor space. 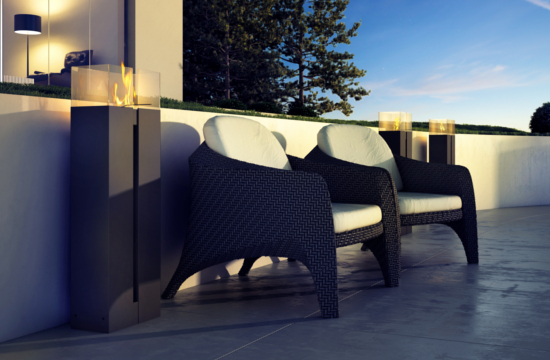 We even sell a range of bioethanol fire bowls, perfect for making an impression. Decide what type of design you want from impressive wide bioethanol fires to fire ribbon burners and much more. With so many different exciting designs and models to choose from, you will definitely be able to find the perfect bioethanol fireplace for your home. Choose a remote control model for an extra impressive feature, designed to make your new fireplace a dream come true. Interested in learning more about bio fires? You can contact us today, and we will be happy to assist you with a purchase, explaining more about the benefits an ethanol fireplace can bring to your property. Our CVO1000 Fire Ribbon Bioethanol Burner. We supplied this with the standard black steel enclosure. We have many bioethanol fireplace designs from burner trays up to 1850mm wide, remote or manual control, wall mounted fireplaces, built in fireplaces, freestanding fireplaces and outdoor fireplaces.